Strangely enough, though I have touched on Greenwich Street often (it runs from Battery Park up the West Side all the way through Tribeca and Greenwich Village into the Meatpacking District) I have never dedicated a FNY page to the street taken as a whole. 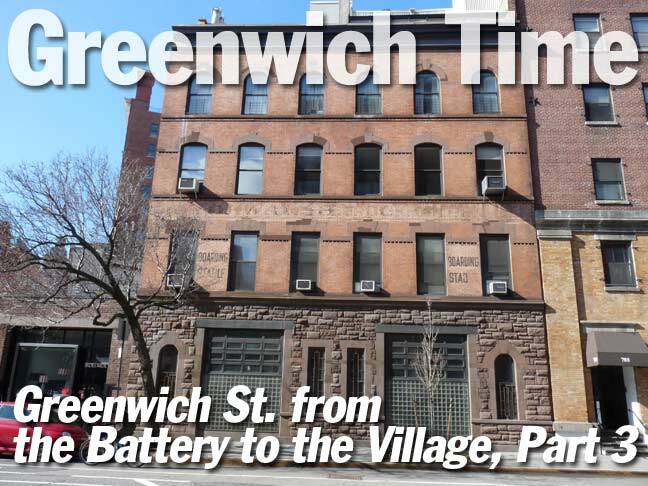 (I have done a Greenwich Avenue page; the street is not to be confused with the avenue.) I had thought Greenwich Street would be fairly straightforward — but I shot about 250 photos along its entire length, which should be good for multiple posts and to move things along, I may have to do a midweek post. Between Spring Street and the West Village Greenwich Street runs through a very quiet region, quiet even in broad daylight on weekdays, home to light industry and warehousing, though as we’ve seen at the end of Part 2, glass box residences have been making incursions to Manhattan’s far west side. 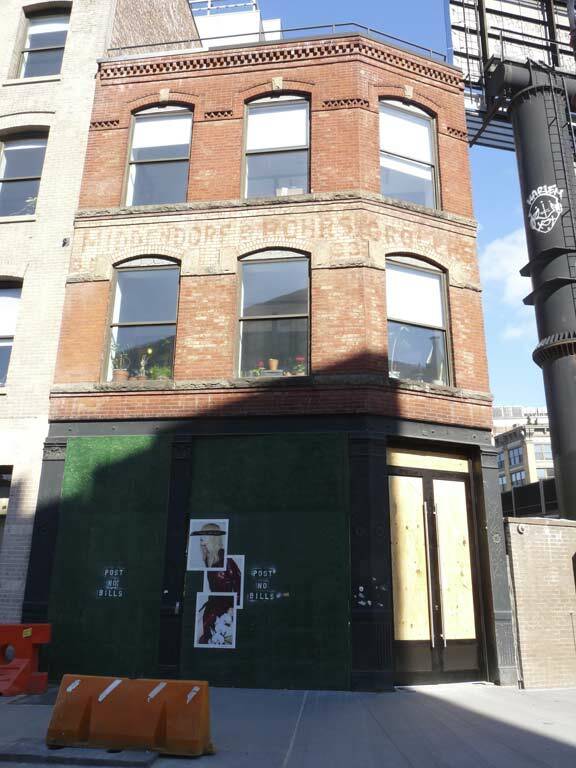 I was surprised, and a little dismayed, to see a building where I had worked briefly in 1992 has been torn down, no doubt to be replaced by pricey apartments. 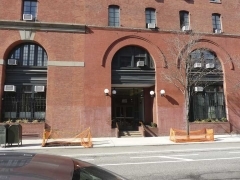 I worked at ModKomp, at 545 Greenwich, for two months in the spring of 1992. It was once of the more rough-and-ready environments I’ve worked in. ModKomp was an old-school type of place and I entered via a loading dock; the shop itself looked like a typesetting and printing museum and contained machinery from a different, prehistoric age. Owner Henry Kuhn was a “mensch,” however, and when I was hired for my next job at Publishers Clearing House, he gave me a lift out to Port Washington to look at at an apartment there (it was a rec room in a basement; I didn’t take it). I did enjoy working in the far west Village, and walked from the train from Bay Ridge through the Village and also roved Tribeca on my lunch hour, laying the groundwork for Forgotten NY. This and the new computer knowledge I had acquired were putting the FNY pieces in place, though I did not realize it at the time. Who knows Henry’s whereabouts these days, and the building where his business was located is gone. Curious about my other workplaces? Check out this FNY page. 325 Spring Street fills an entire rectangular block between Spring, West Houston, Washington and Spring Streets and has been home to several trucking businesses, including United Parcel Service, since 1949. 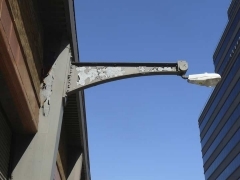 Personally, I’ve always treasured the building for its bulky, Machine-Age-inspired lamppost masts, which likely originally carried Westinghouse AK-1o “cuplight” incandescent lamps. 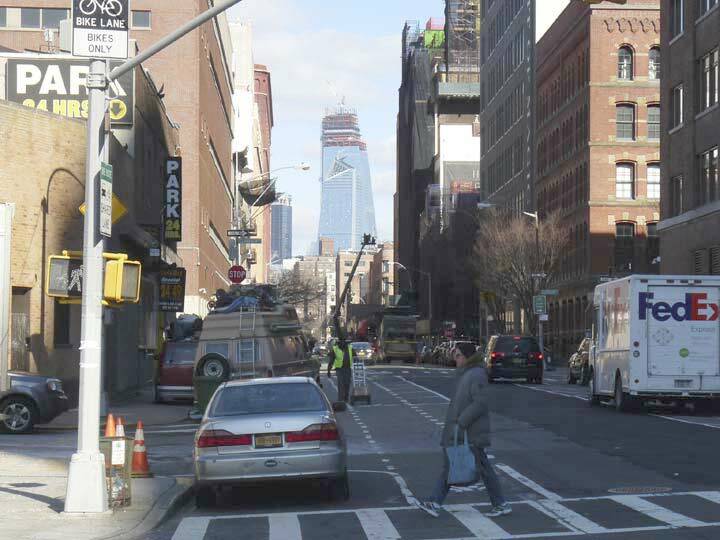 Greenwich Street, looking north toward the unfinished towers of the Hudson Yards megadevelopment can be sen in the distance. Houston Street cheats a bit in order to reach West Street: it must pass under a building called the St. John’s Center, a.k.a. 550 Washington Street. St. John’s Center is actually the southern end of the old West Side Elevated Railroad (aka the High Line) and the name St. John’s Center actually goes back to the 19th Century: it remembers the former St. John’s Chapel of Trinity Church, which stood on nearby Varick Street until it was razed in 1918. The church is also recalled in the subway station mosaics at the IRT Canal Street station at Varick. It appears that St. John’s Center may be razed sooner than later, and several high-rise apartment buildings (masonry for a change instead of glass) will replace it. 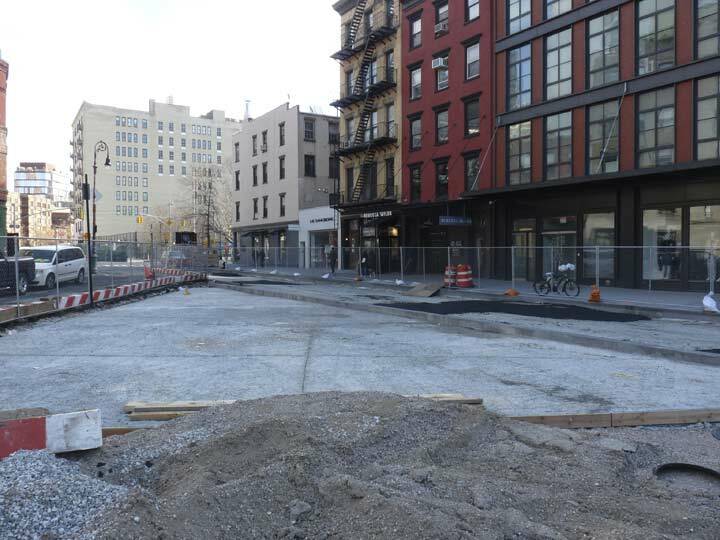 At the same time, Houston Street will be rendered open to the sunshine between Washington and West Streets. Railroad.net has the whole story on the West Side Improvement. 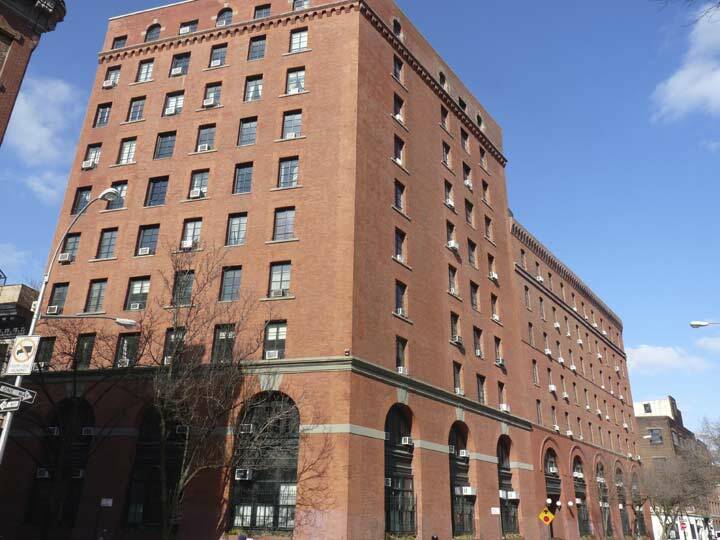 Mid-Greenwich Street is dotted with buildings that were constructed as mere warehouses, but have the casual brick and masonry elegance common to pre-WWII architecture. 603 Greenwich at Clarkson was built from 1900-1903. 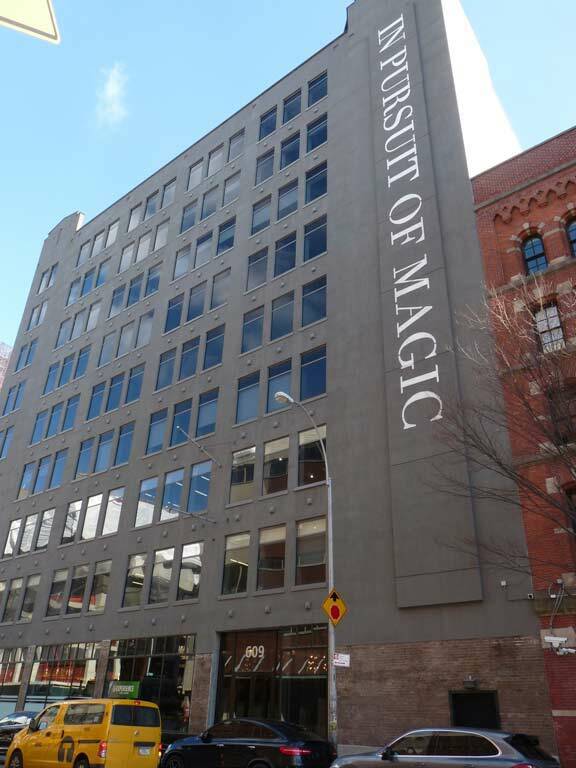 “In Pursuit of Magic” was an art installation installed at several locations in NYC (including here at 609 Greenwich) and San Francisco in 2012, sponsored by a charity organization, the Lulu and Leo Foundation, which is dedicated to encouraging creativity in public schools. 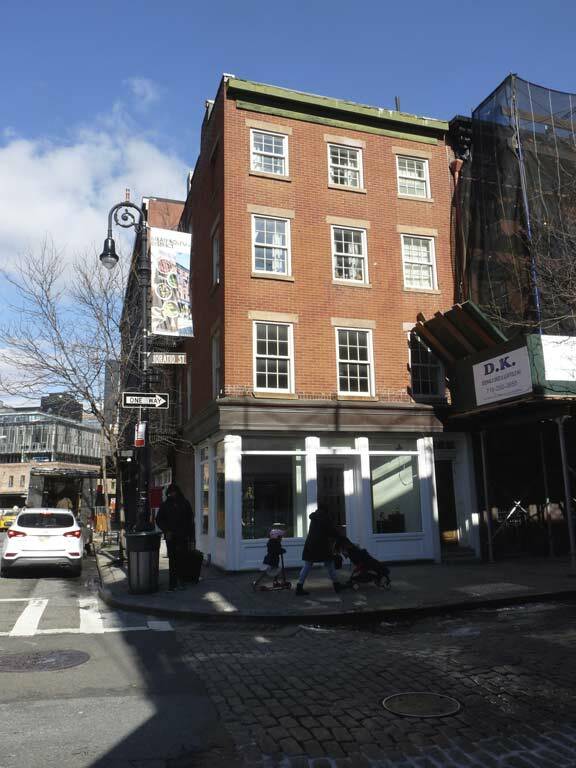 Though they don’t have a “full house,” TV’s Mary Kate and Ashley Olson’s fashion empire, The Row, occupies two floors at #609. 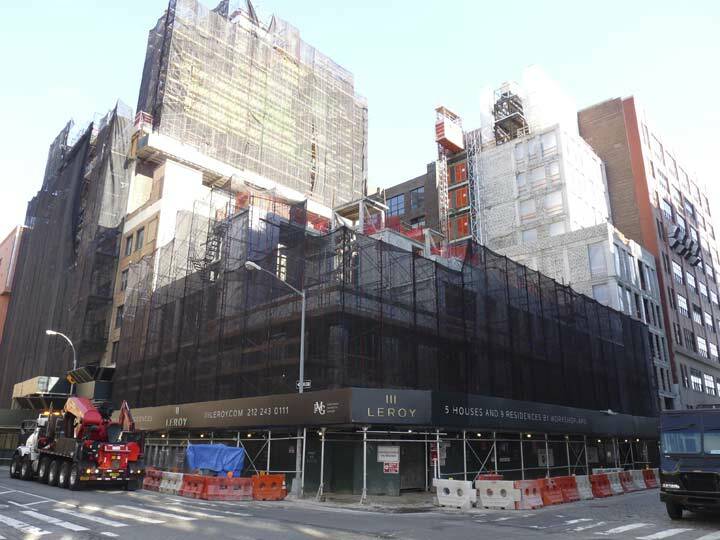 The new condo project 111 Leroy is far from finished, but renderings have appeared online. 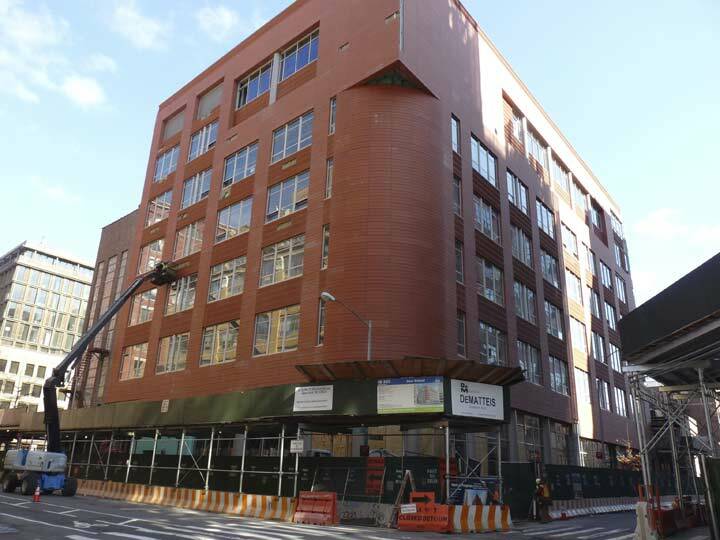 Project after project is arising on mid-Greenwich Street. This one, to be Intermediate School (a.k.a. “junior high”) 323 at Greenwich and Morton Streets, is echoic of a structure a couple blocks north of here (see below). It is actually an older loft building that has had several additions made to convert it into a school. 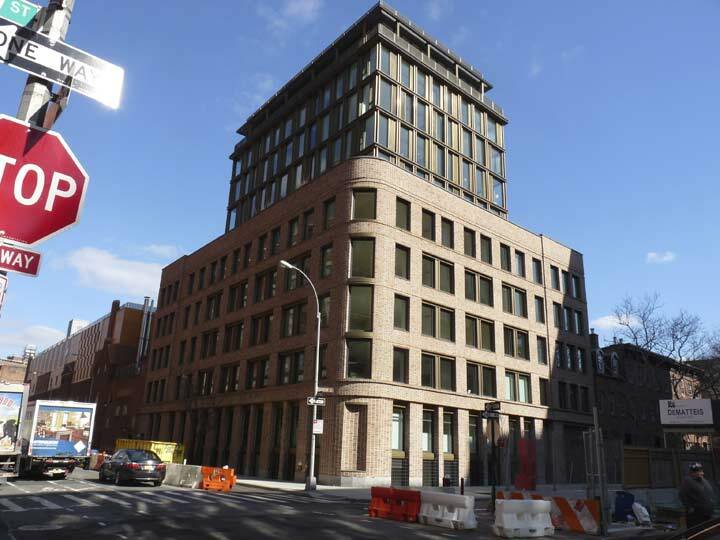 Another round-corned building at Greenwich at 100 Barrow, on land leased by the Church of St. Luke-in-the-Fields, in a brand new brick and masonry condo building in lieu of the usual glass boxes. 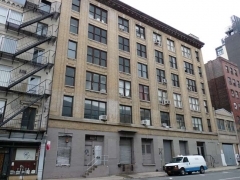 Its 33 apartments will run you $2.9 million to $13.3 million. The square penthouse is a strange topper. 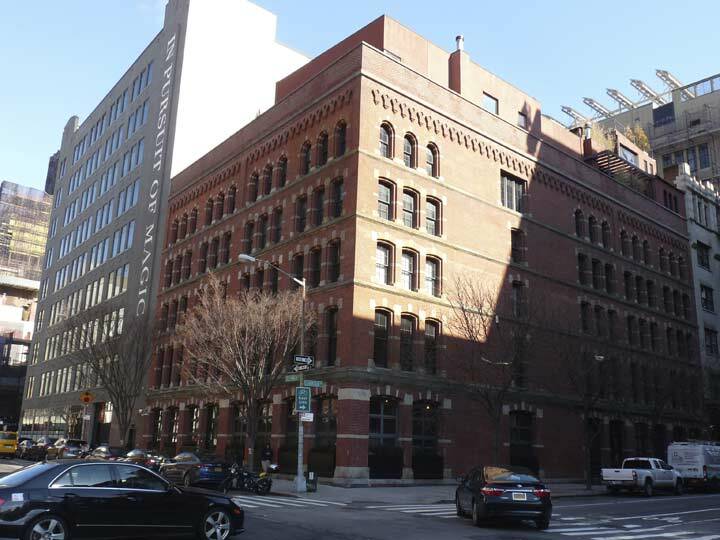 The granddaddy of round-cornered buildings on this stretch, and likely the model for the others, is The Archives, occupying the entire block defined by Christopher, Greenwich, Washington and Barrow Streets — one of the few buildings in New York City to do so. It was constructed from 1892-1899 as a warehouse for goods awaiting inspection by US Customs. 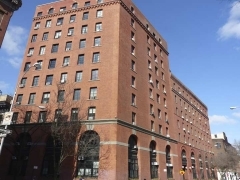 Later it became U.S. Federal Archives Building; it is currently home to condominiums, but there’s a supermarket, gym and dry cleaners on the ground floor as well as a theater in the interior. 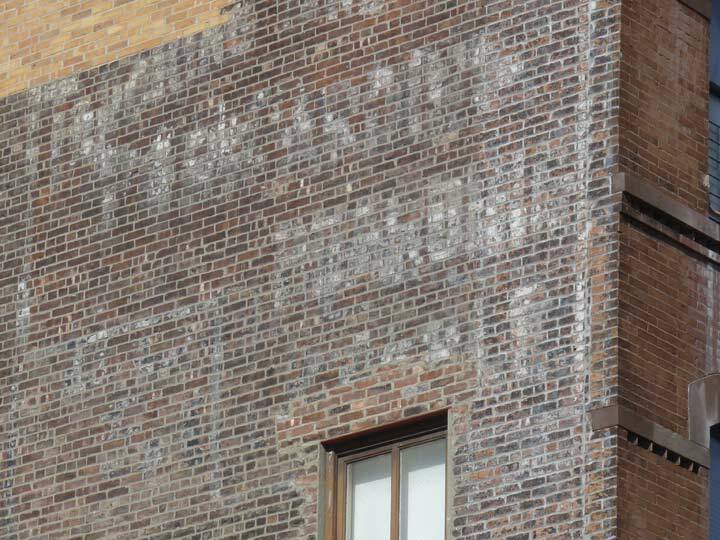 The former Coy-Disbrow Paper Company ad has faded, but not illegibly. Actually this ad is younger than some of the other ones of its type. The company moved to this building on Greenwich between Christopher and West 10th in 1930; the wholesale company had been founded by Robert Henry Coy (1877-1942) and Hamilton Thomas Disbrow (1852-1942) in 1922 on Canal Street. Disbrow was called “dean of commuters” of the Delaware, Lackawanna & Western Railroad after traveling to the city from New Jersey every day for over 70 years. Much more on Walter Grutchfield’s page. The building beneath it was constructed as early as 1819. The blocky, twin-peaked St. Veronica’s Church was completed in 1903, after thirteen years of construction. The parish had been in existence since 1887, founded to serve Irish dockworkers along the Hudson. The site had, decades earlier, been occupied by Newgate State Prison, which closed in 1829, but is depicted in the mosaic work of the IRT Christopher Street station built in 1912. Beginning in the 1980s, the church together with Mother Teresa began a ministry to AIDS victims. In June 1993 an AIDS memorial was installed at the church to commemorate over 1000 area victims. The church holds an interfaith service every June in Gay Pride week. According to Christian tradition, St. Veronica was a woman who witnessed Christ’s forced march carrying the cross to Calvary. She wiped his face with her veil, and an image of His face was impressed on the veil. UPDATE: St. Veronica had merged with nearby Our Lady of Guadalupe in 2007. The church officially closed in June 2017. Round-edged buildings are a theme around here, 141 Christopher, at the NE corner of Greenwich and Christopher, home of Nighthawks Coffee Shop, likely named for a painting by Edward Hopper, inspired by a similar 24/7 cafe in the Village. The aboveground Port Authority Transit (PATH) subway entrance on Christopher just east of Greenwich is the system’s most ornate Manhattan entrance. 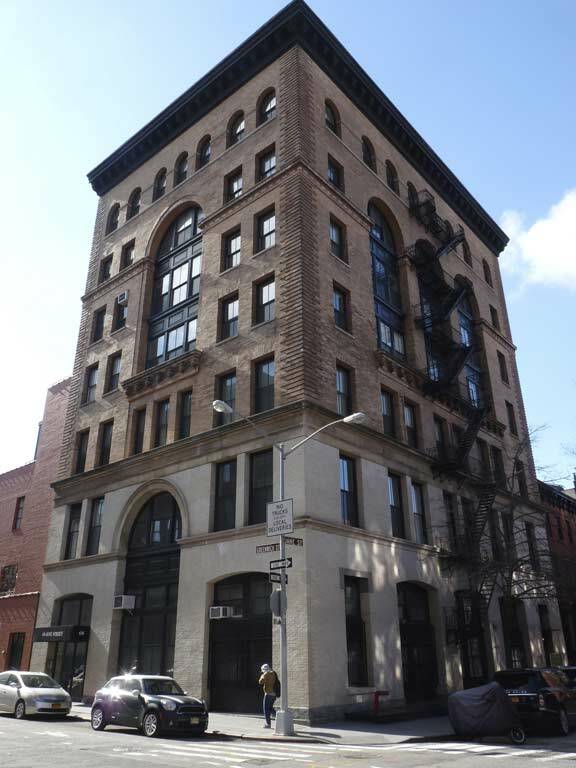 At #137 between Hudson and Greenwich, it’s actually its own freestanding building, constructed in 1912, with a chiseled “Hvdson (with the V of Importance) & Manhattan R.R. Co.” sign at the roofline and a restored iron and glass marquee in front. 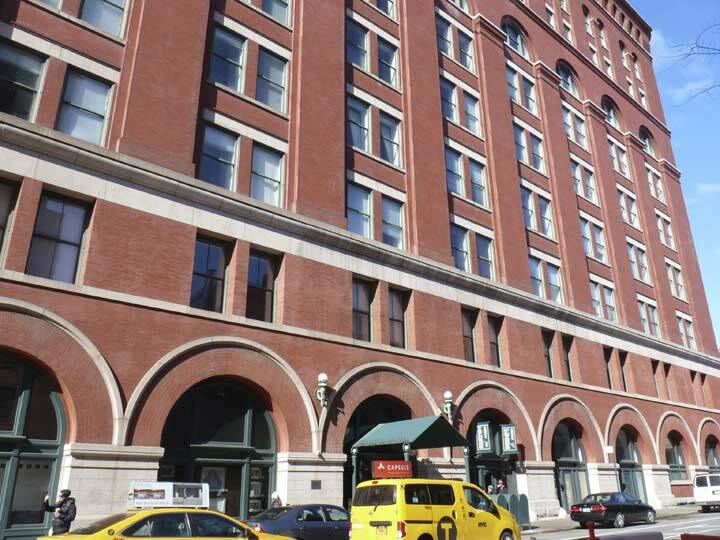 The AIA Guide to NYC says it’s reminiscent of a London tube station entrance. 687 Greenwich, a condo complex between Christopher and West 10th, is accessible from a short gated alley, which I suppose could have been given a name, but wasn’t. 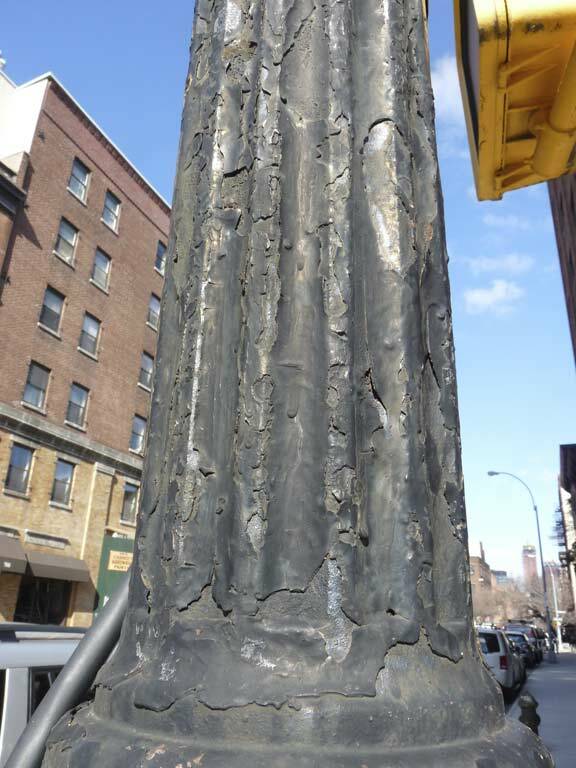 The Bishop Crook at the NE corner of Greenwich and West 10th Street goes back to perhaps the 1920s and while design-wise it’s identical to retro versions being installed today, it can be differentiated because of its rust and also the lack of a garland encircling the shaft, which modern Crooks have. 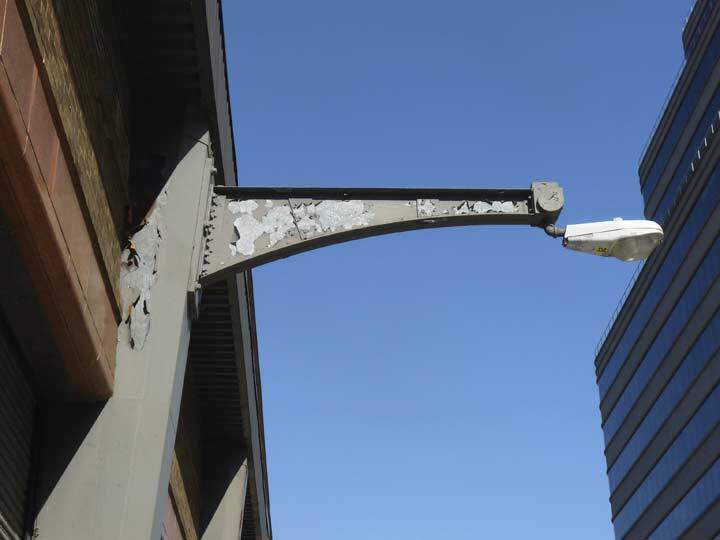 It also has a long-disused bracket for street signs. I’ve covered this lamppost extensively in FNY before. Since an elevated train ran along Greenwich Street until 1940, this post may be only that old. 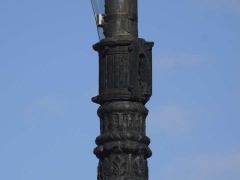 Had it been older it would have been a Dwarf post, just tall enough to fit under the el (unless the el was high enough off the ground to fit a regular size Crook. Just across the street on Greenwich we see a remnant of a time when beasts of burden were the primary means of transport. The building on the NW corner of Greenwich and West 10th bears several stable signs and a pulley for hay bales at the roofline. 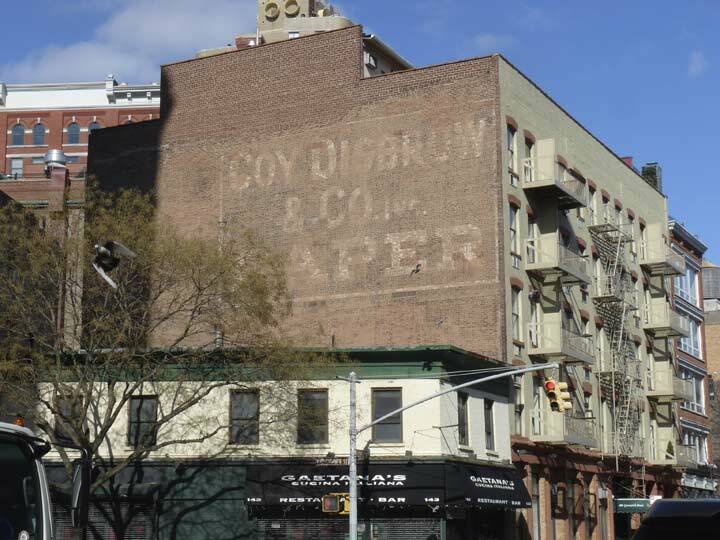 On the West 10th Street side, more faded signs hint that they were placed there at a time of transition from ole Dobbin to motorized transport. Based on old photos I’ve seen that would date this sign to the early 1920s, though horses were still seen pulling wagons well into mid-century, and of course the NYPD has always had a mounted division. 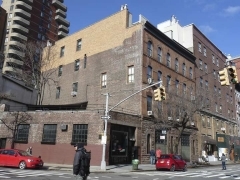 According to a Greenwich Village Historic District designation report, the building dates to 1911 and there was a trucking business here until 1921. Interestingly, actor Wesley Snipes owned the building from 1998-2000. 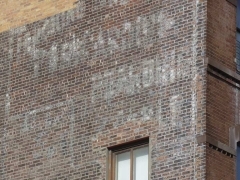 A painted ad on the side of the building is nearly illegible. I make out the word “boarding” but not much else. 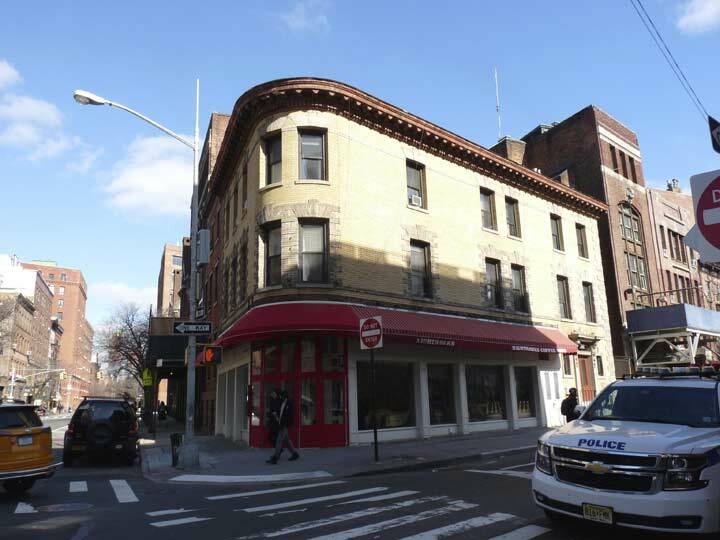 The western edge of the large Greenwich Village Historic District runs down the middle of Greenwich Street between Barrow and Perry Street, so that structures like these two walkups on the west side of Greenwich at Charles don’t make the Landmarks cut. 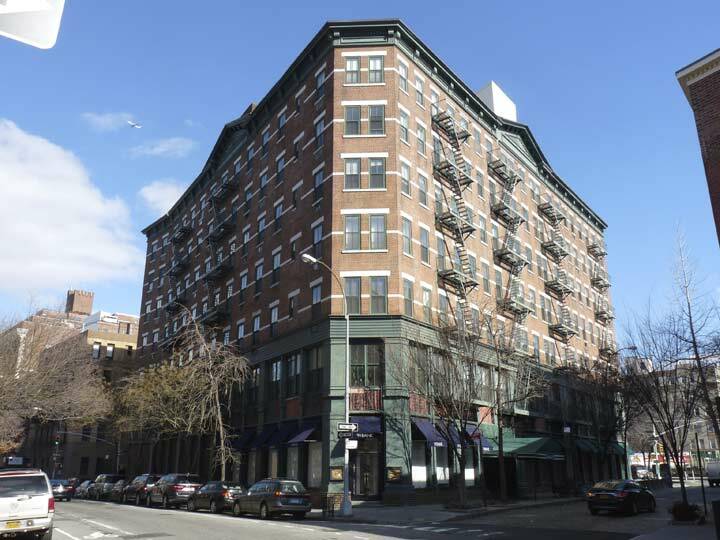 The massive Towers building, #720 Greenwich at the NW corner of Charles, was also not Landmarked. The construction is reminiscent of The Archives on Christopher, 2 blocks to the south. It appears as if 121 Charles , at the NE corner of Greenwich, has been here forever but it is actually a 1967 interloper. 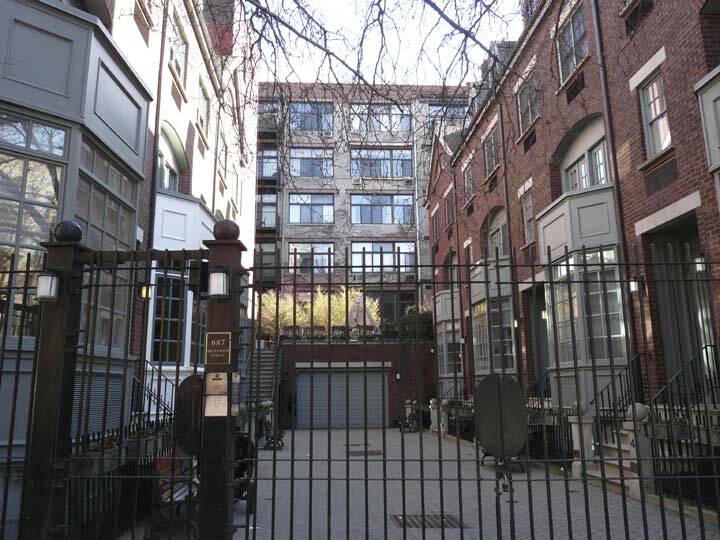 It is an 1809 farmhouse moved here by Sven and Ingrid Bernhart after it was discovered after a demolition on York Avenue and East 71st Street, and trucked downtown to this spot on March 6th of that year, along with some of the cobblestones adjacent to it: hence the building’s nickname “Cobble Court.” While uptown it had been the home of author Margaret Wise Brown (1910-1952; Goodnight Moon). 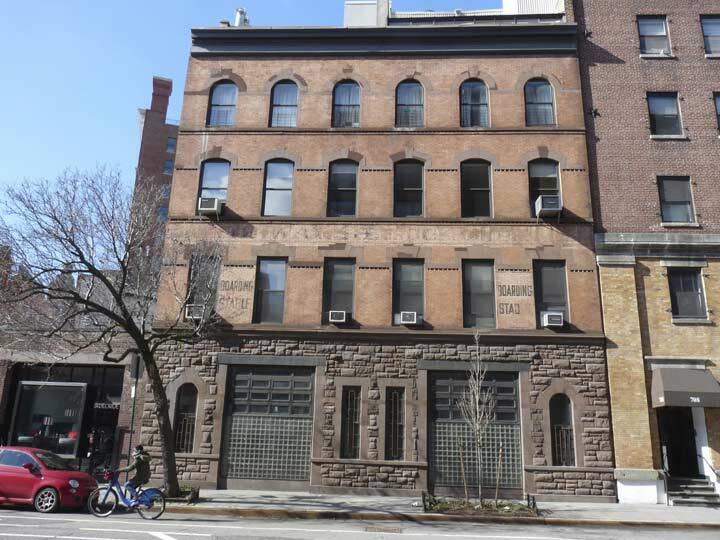 The building hasn’t been landmarked, as the Landmarks Preservation Commission sometimes doesn’t designate buildings that have been altered considerably from their original condition. Just north of Charles, #719, constructed in 1909, has a brand new façade in 2018, compared to this screen shot from September 2017. 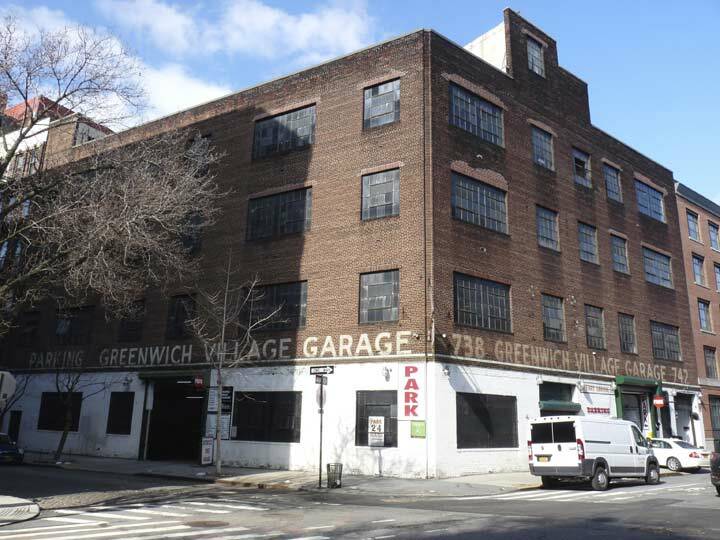 The Greenwich Village Garage, #738-742 Greenwich at Perry, still boasts decades-only painted signage. On the corner is a metal sidewalk sign (edge on here, so you can’t see it) which seems almost as old. The garage, constructed in 1930, seems to have its original casement windows. If you look at a map, the Greenwich Village street layout is more complicated than it originally appears. While West 4th Street turns northwest and intersects with West 10th-13th Streets (because the West 4th Street name was slapped onto an earlier existing street) the grid itself changes orientation. Christopher through Bank Streets approach the Hudson River at different angles than streets north and south of them. Thus, lengthwise streets such as West, Washington, Greenwich and Hudson have X-shaped intersections, not plus-sign-shaped intersections. Corner buildings, like #117 Perry Street at Greenwich, have to have odd shapes to fit their plots. The building is actually a nonagon built from 1903-1904. In that era architects would make windows different shapes and differently-styled window lintels, just to please the people walking past it, and give pride of place to people living in it. People don’t need that anymore, and it’s a waste of money, is the thinking behind uniform glass boxes. #737 Greenwich just north of Perry is one of the older buildings on the stretch. 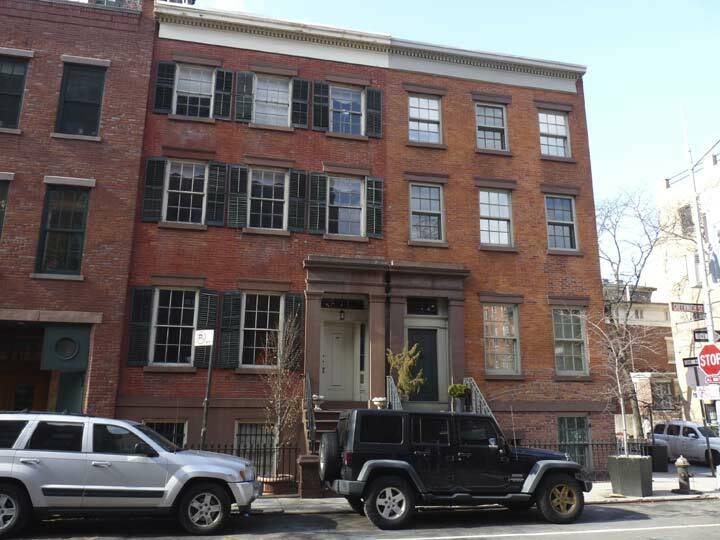 According to the Greenwich Village LPC designation report (pack a lunch if you want to read the whole thing) it was constructed in 1838 for a tinsmith named George Greeson. “This Greek Revival residence of brick is now three stories high and has had its original design altered.” The report then goes on to notate the changes over the years. Funny, because the LPC has refused to designate structures in the so-called “outer boroughs” because… they had been altered from their original designs. 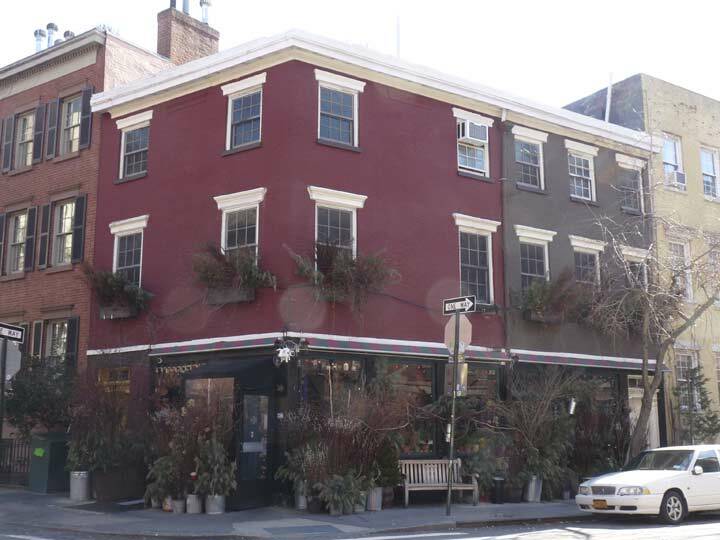 The 3-story corner building, #749 Greenwich/#314 West 11th, was built in 1835 and is the longtime home of popular Greenwich Village restaurant The Spotted Pig. In a familiar story, its owner has been accused of harassment and its future may be uncertain. A trio of Greek Revival residences at #753-757 Greenwich north of West 11th are covered in ivy in the warm months. They were all constructed by 1836 for a butcher named Henry Pray who lived in one and rented the other two. #761 and #763, as well as neighbor #765 out of the picture on the left, were originally all the same size when they were constructed as a row in 1836 for grocers W. and J.P. Harriot. All three were originally only 2 1/2 stories high and were raised to different heights over the years by adding stories. Yet another apartment building with an odd shape is 99 Bank Street on the NE corner of Greenwich. 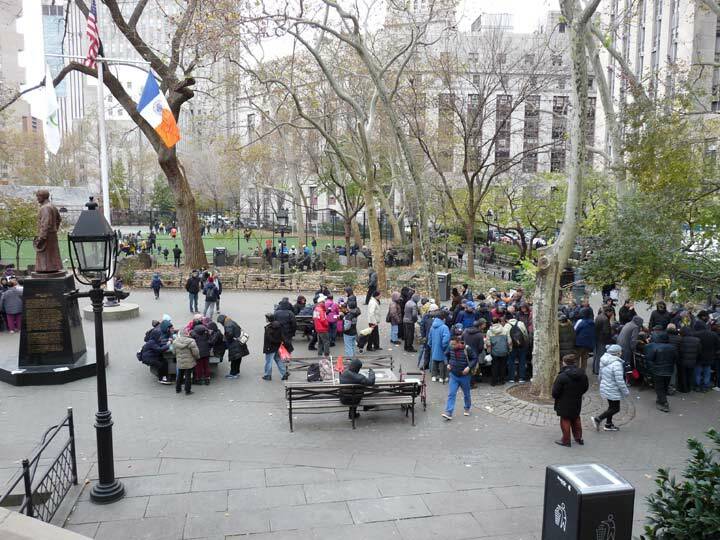 It occupies the entire block between Greenwich, Hudson, Bank and Bethune. Notice on the extreme left that the building’s facade curves to match a slight incline in Greenwich, which here comes as close to its sister street, Hudson, as it ever does; when laid out in the late 1700s and early 1800s, it followed the contour of the Hudson River –west of here, streets were built in landfill. 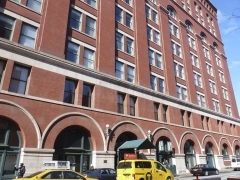 The loft building, originally used for warehousing and General Electric sales training, went up in 1890. Above Bethune Street the street grid returns to “normal” and square intersections return. 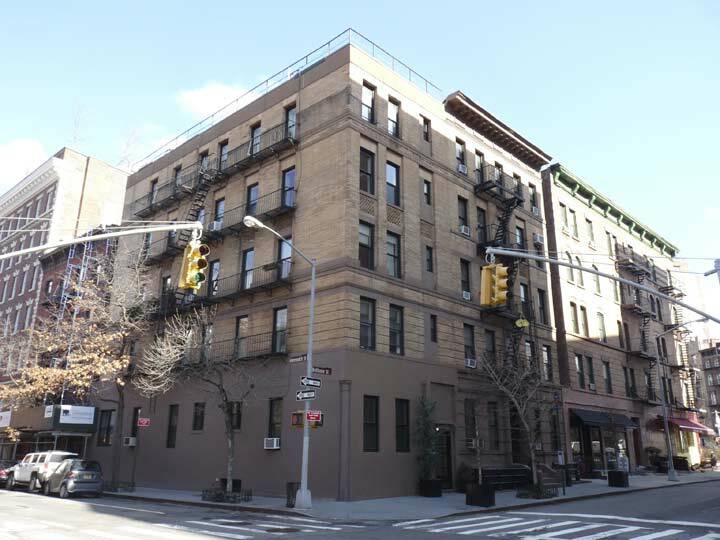 The pair of handsome apartment buildings here, #8 and #10 Bethune, were constructed in 1896. 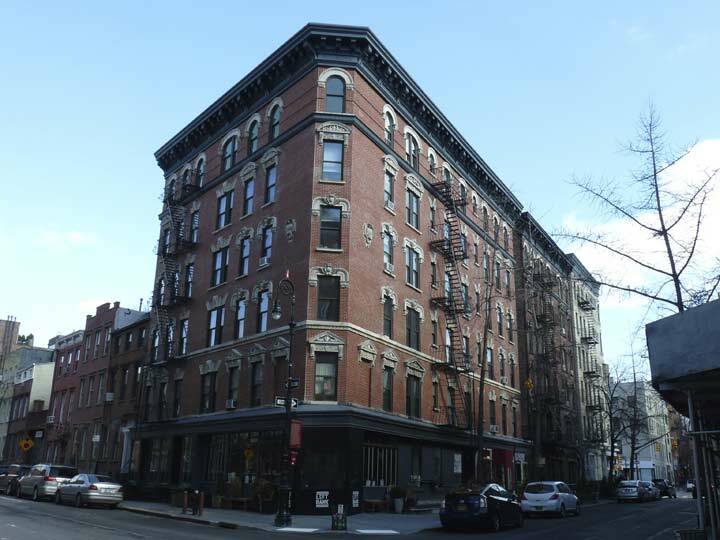 The street was named for a woman, Johanna Bethune, a philanthropist widow who deeded the land on which the street was built to NYC. With fellow widow Mrs. Alexander Hamilton, she funded the former NY Orphan Asylum in 1806 at Barrow and West 4th Street — which was originally named Asylum Street in its honor. When the asylum was demolished in 1833, Asylum Street became West 4th Street and thousands of NYC visitors have been confused ever since. D’Agostino, Greenwich and Bethune. The supermarket chain was founded in 1932 by Italian immigrant brothers Pasquale and Nicholas D’Agostino in Yorkville. At the time, a store selling meat, produce and baked goods under one roof was innovative, as shoppers had to visit separate shops before that time. Over time new stores were opened, expanding to the West Side and Westchester, and TV commercials featuring a jingle with the words “Please Mr. D’Agostino, Move Closer to Me” proliferated. At its 1990s peak D’Ag had 26 locations; by 2018, that had been reduced to ten. 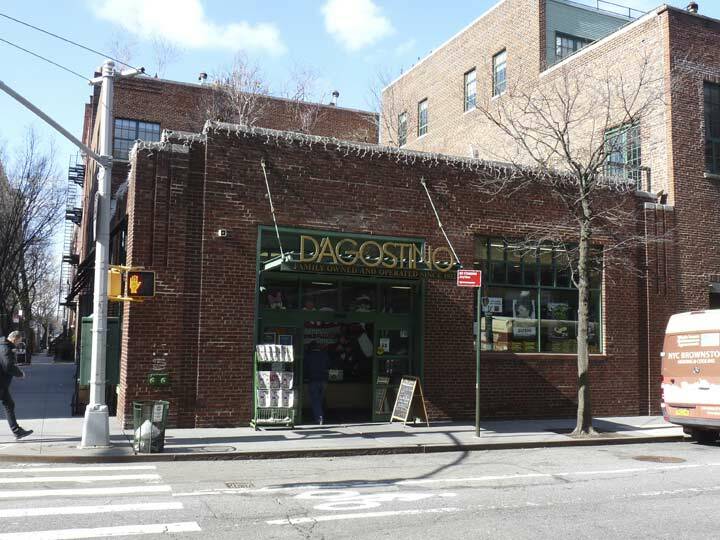 I have never been in a D’Agostino, which did not deign to expand into Brooklyn or Queens (except for a location in Brooklyn Heights). Currently, my supermarket is the Stop & Shop on Northern Boulevard. When I worked in Port Washington there was a King Kullen there as big as an airfield. 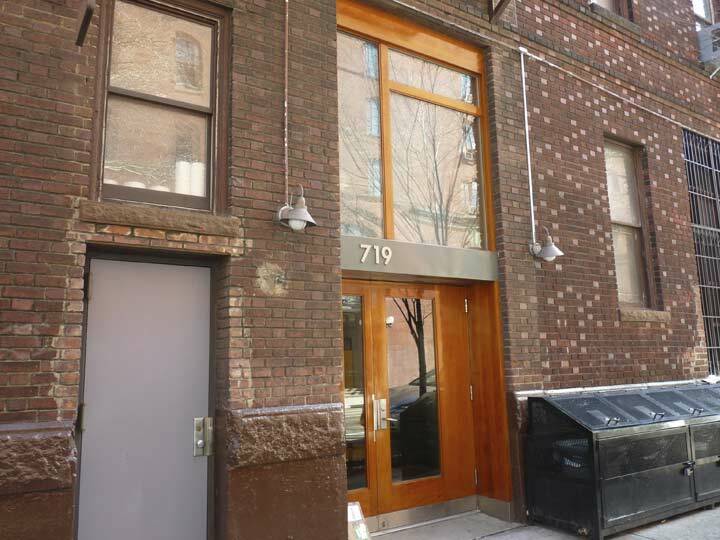 607 Hudson Street fronts on both West 12th and Greenwich Streets. 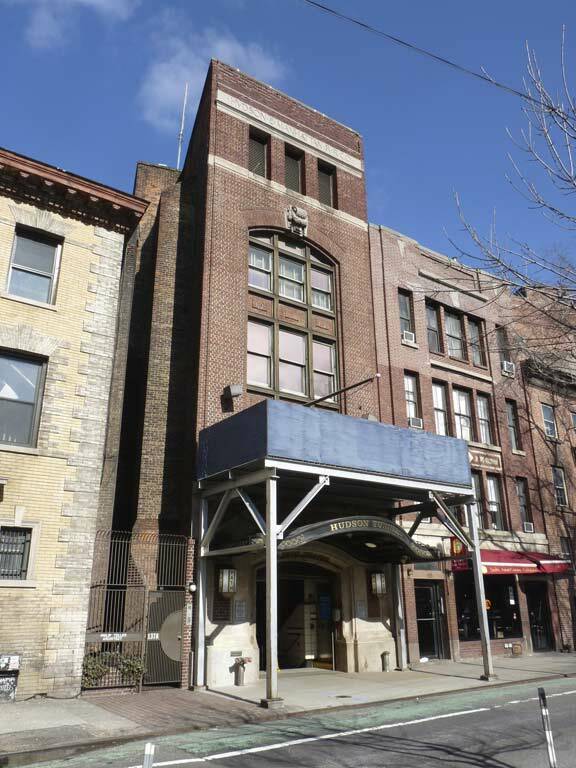 Constructed in 1905 in a Neo-Federal style, it was formerly a hotel and later, the Village Nursing Home but was converted to condominiums in 2012. 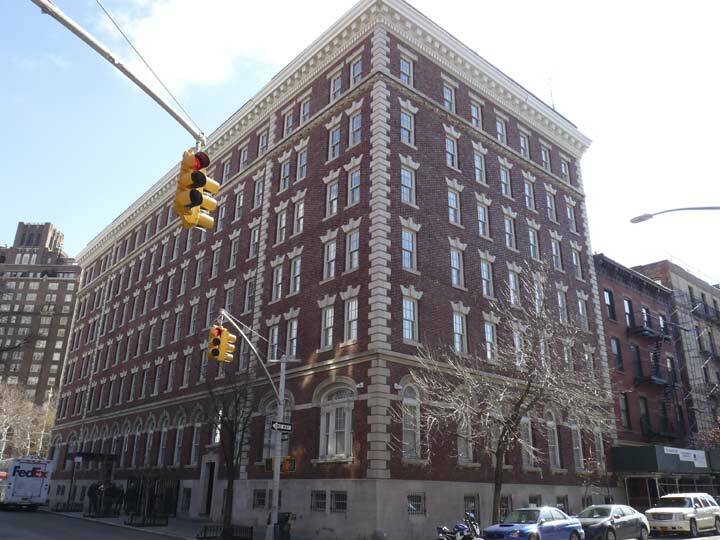 The building was renamed the Abingdon, facing the square at W. 12th, Hudson Street and 8th Avenue. 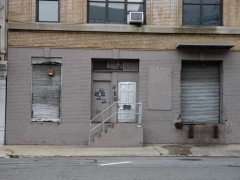 Though its front door is clearly on Greenwich Street a considerable distance from Jane, this former factory building is known as #68 Jane Street. Though Bethune Street is named for a woman, Jane Street isn’t. The origin is in dispute, but a local early 19th Century landowner was named Jaynes. His house, constructed in 1750, survived until 1890. 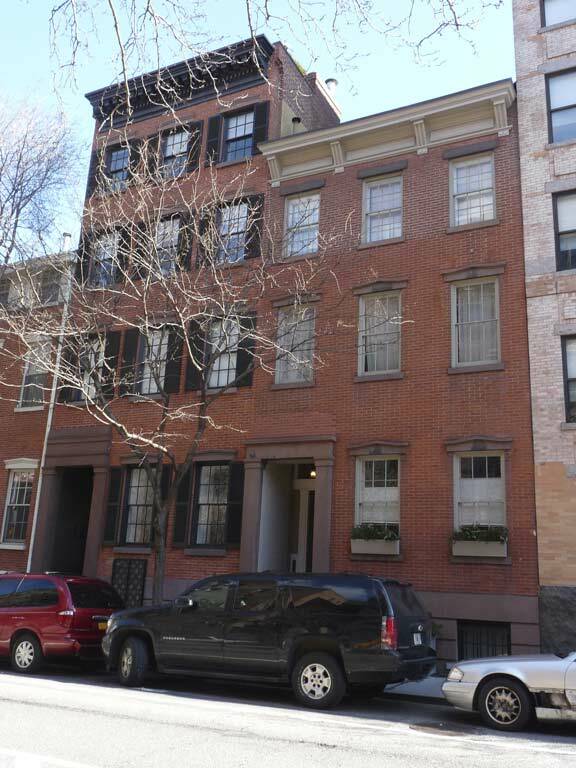 Supposedly, Alexander Hamilton was taken to the house, by then owned by the Bayard family, in the aftermath of his fatal duel with Aaron Burr. Why did he come to a building so far away from Weehawken? That’s why I take a salt shaker with the story. Once again, as you riffle through these images, bear in mind that Greenwich Street was completely shrouded by an elevated train in various stages between 1868 and 1940. The el shadowed most of these buildings shown here. A pair of Greek Revival townhouses, #828 and 830, on the SW corner of Greenwich and Horatio Streets. 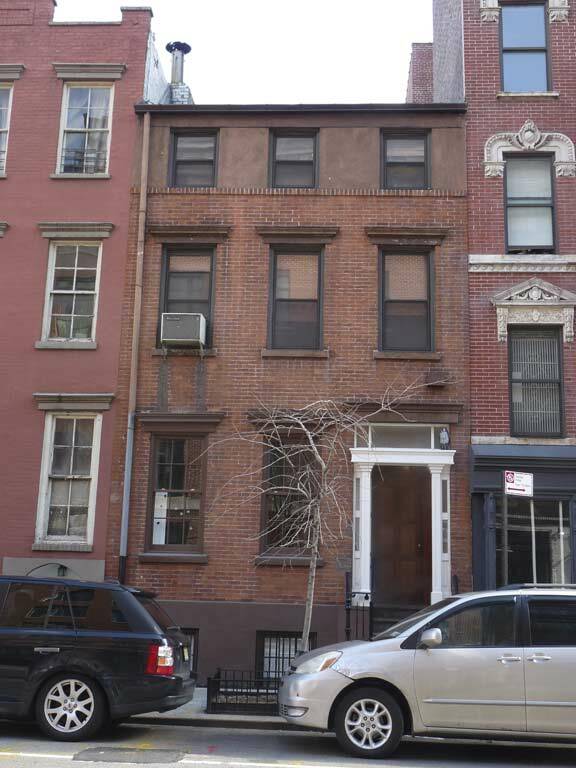 This architecture was once the bread and butter of Greenwich Village residential architecture. 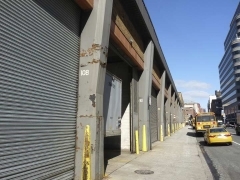 Though very little actual meat is now being packed in the Meatpacking District anymore — meat wholesalers have gradually moved out, most to Hunts Point, over the last couple of decades — the name has stuck, even as it became a high-end retail and hotel/residential area. The area’s few remaining meat dealers are clustered along Washington and Little West 12th Streets in an L-shaped sliver below High Line Park. 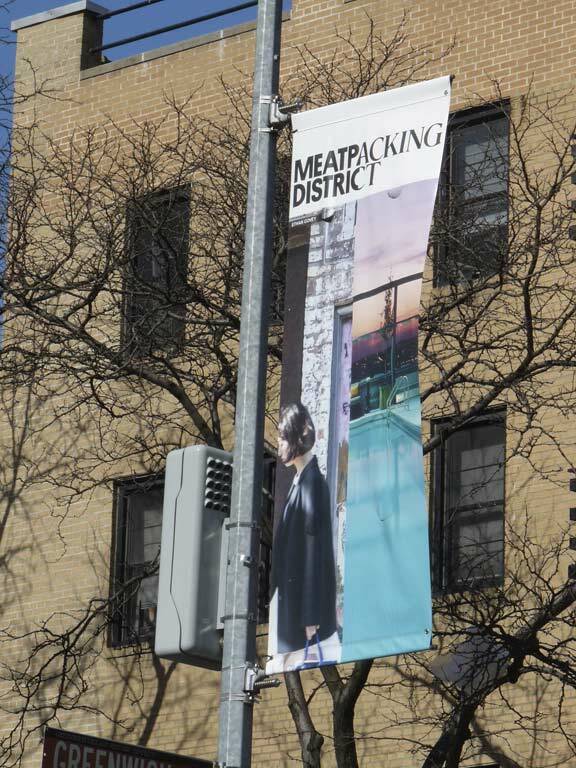 Banners advertising the Meatpacking have appeared along Greenwich Street. Ice from a recent snowstorm is wedged between the Belgian blocks on Horatio Street. 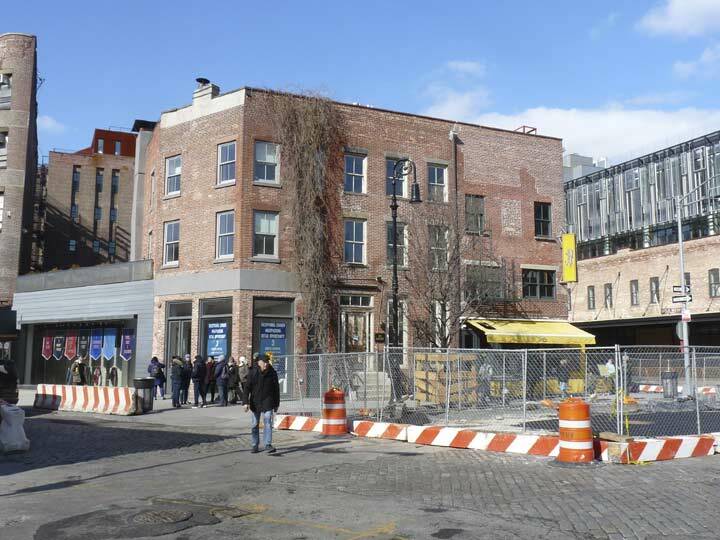 FNY chronicled the Meatpacking District in 2006 and again in 2009, when there was more meat being packed than today. 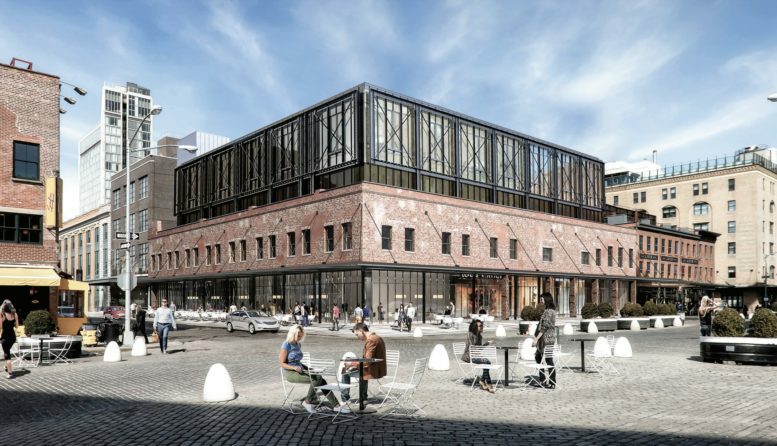 The Greenwich Village Landmarked district leaves off at Gansevoort Street, but the Gansevoort Market Landmarked District, designated in 2003, sits just north of it, and its historic buildings are preserved — after a fashion. Sorry to have to tell you but one of my favorite open expanses in Manhattan is being partitioned. 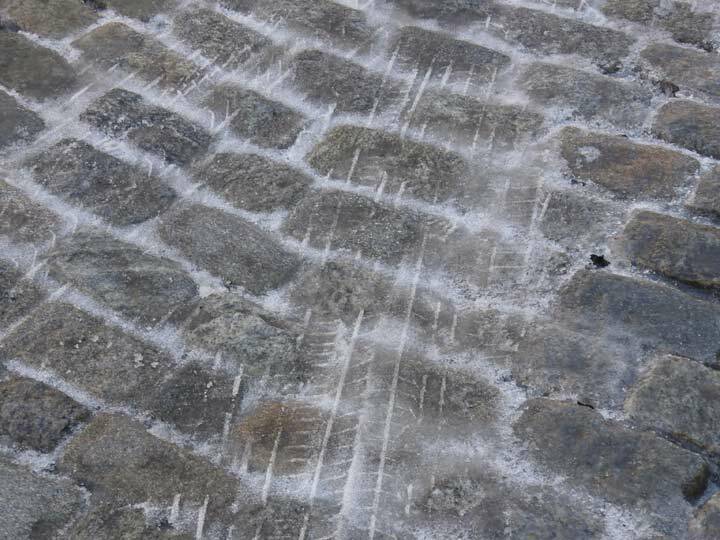 Until the mid-2000s, the confluence of Greenwich Street, 9th Avenue, Gansevoort and Little West 12th Streets was a vast open plaza, completely paved with Belgian blocks. It was an impressive sight. 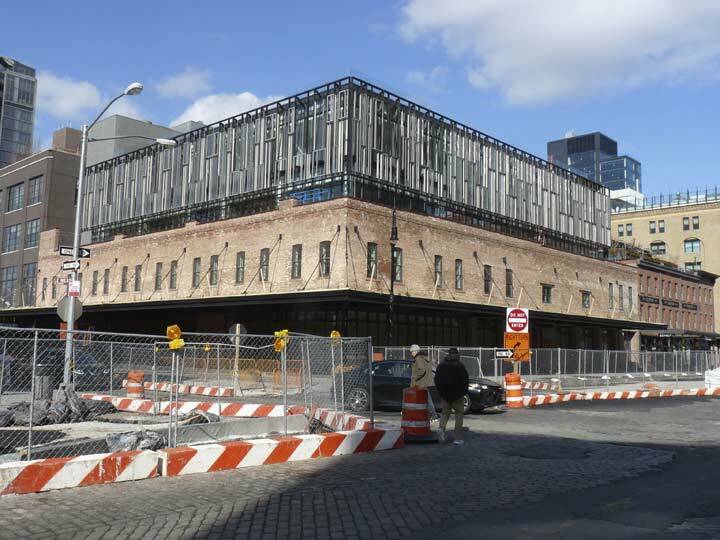 Beginning in the mid-2000s, the city began to micromanage it by installing bollards and seats, and now, in 2018, a concrete triangle is being set up to separate Gansevoort and Little West 12th. The area is apparently more trafficked than ever before. 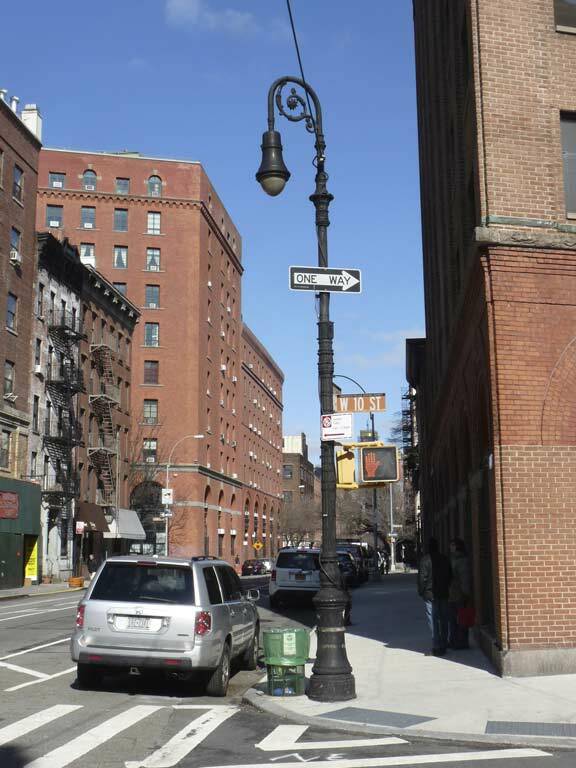 At Gansevoort, Greenwich Street passes its traffic onto 9th Avenue, a road that runs continuously north all the way to West 155th Street, though it changes identities frequently, to Columbus Avenue at West 59th; St. Nicholas Avenue, at West 124th; and Bradhurst Avenue, at West 137th. 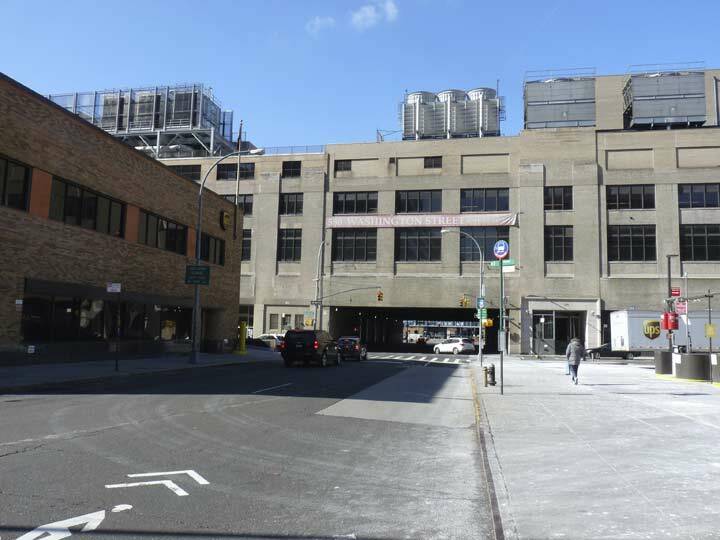 There’s also another short stretch of 9th Avenue in far northern Manhattan running between West 201st and West 208th and again from West 215th, ending at Broadway at the Harlem River. 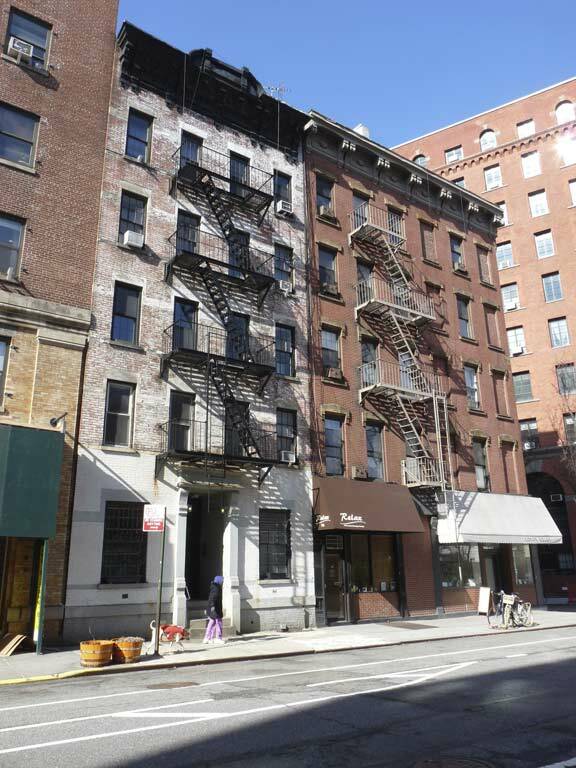 One of my favorite buildings in the area is #1 Little West 12th, which is angled for a short stretch along Gansevoort. 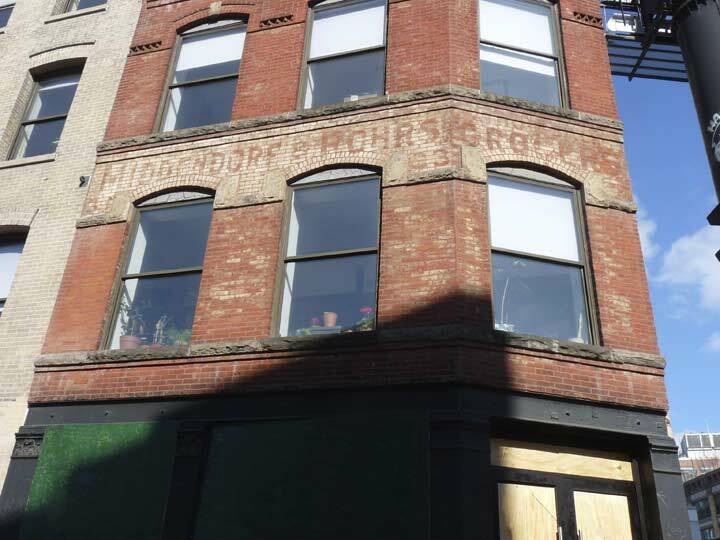 A very faded sign for Middendorf & Rohr, grocers, can be found on the exterior. It was constructed in 1887 and the grocers occupied the building, with other tenants, from 1902 to 1964. 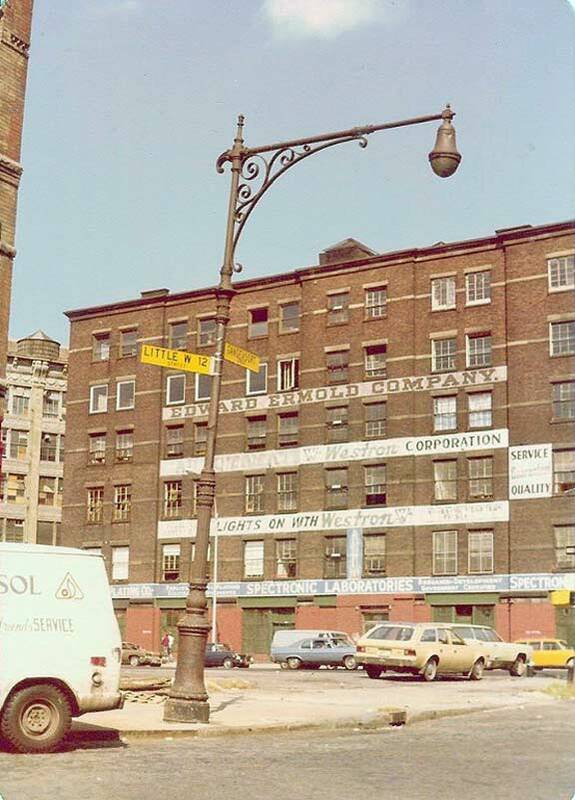 This was also the spot for a late-surviving Corvington lamppost, seen here in a 1978 Bob Mulero photo, which FNY covered in 2008. The building in the background, which once boasted signage for the Edward Ermold Company, Westron, and Spectronic Laboratories, is still there, but the signs are long gone. 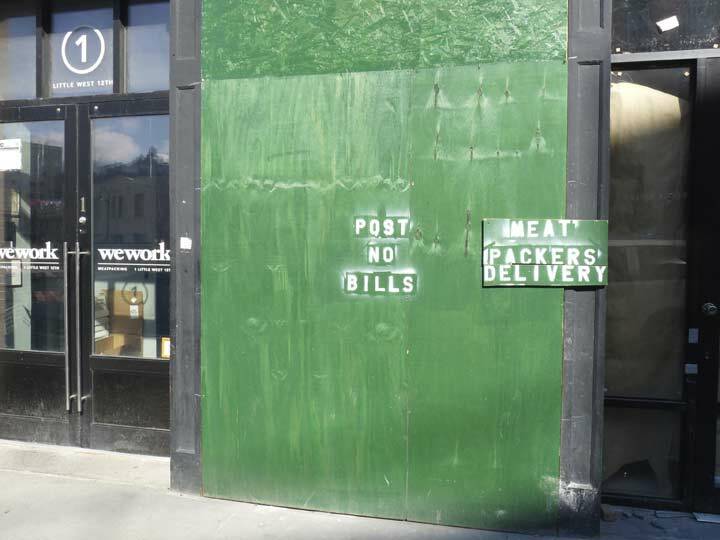 New meets old: We Work, a shared space for freelance workers, and a stenciled “Meatpackers Delivery” sign, possibly left over from the old days. 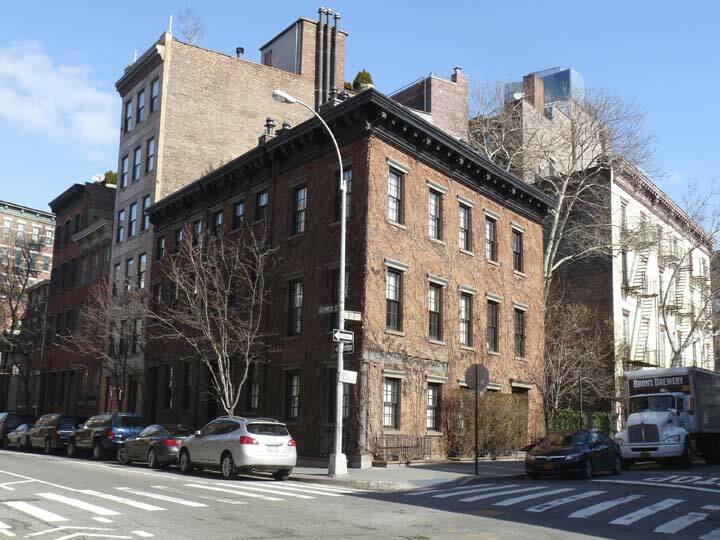 The trio of small townhouses, #3, 5 and 7 9th Avenue north of Gansevoort, the first addresses on the avenue, go back to 1837. 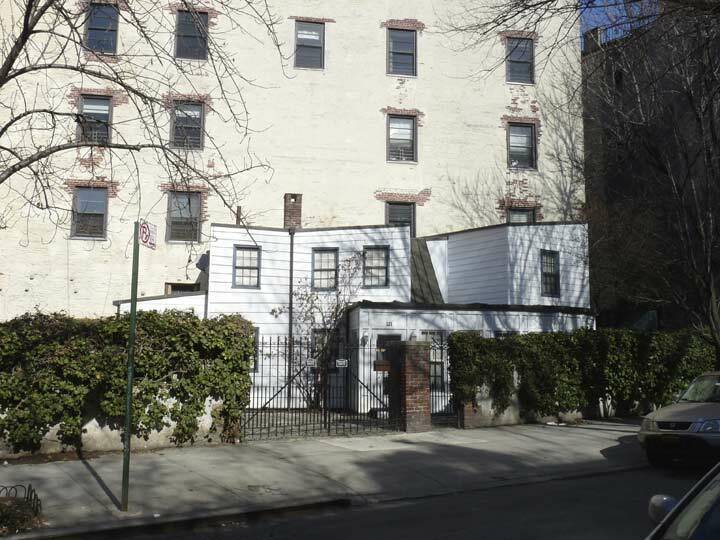 9-19 9th Avenue at Little West 12th goes back to 1887 on land originally owned by the Astor family. It was altered in 1921-22 to a simple brick facade with a metal sidewalk awning. In recent years it was the longtime home of the ritzy restaurant Pastis. 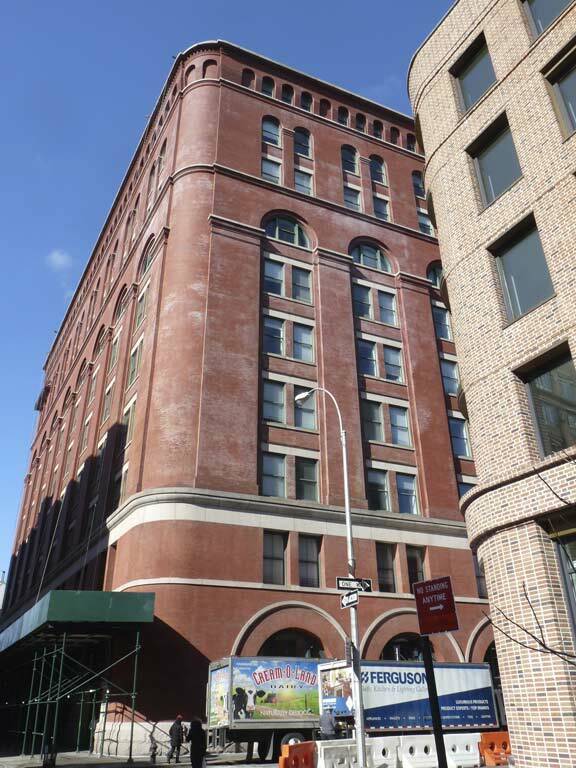 Despite its Landmarked status, a glass box has been built atop the simple brick facing. The city is bent on heavy development in these parts, and a little Landmarking won’t stop progress. I’ll stop here for now, but this walk continued all the way up 9th, 10th and 11th Avenues to Hudson Yards, which I’ll get to soon. 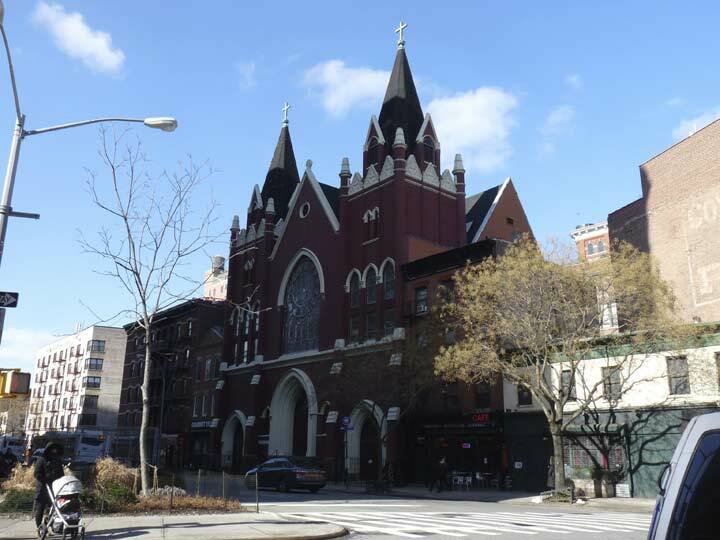 On June 25, 2017 the Archdiocese changed the locks and closed the 115-year-old St. Veronica Church on Christopher Street. There was a local postal station in that old Federal Building at Christopher and Greenwich back in the early 60’s….. Your detailed and comprehensive coverage of these streets, buildings and appliances is impressive indeed, as are the myriad photos. It’s all so very interesting to anyone who loves history, especially landmarking. And thanks for sharing with us your personal memories of these places as well. 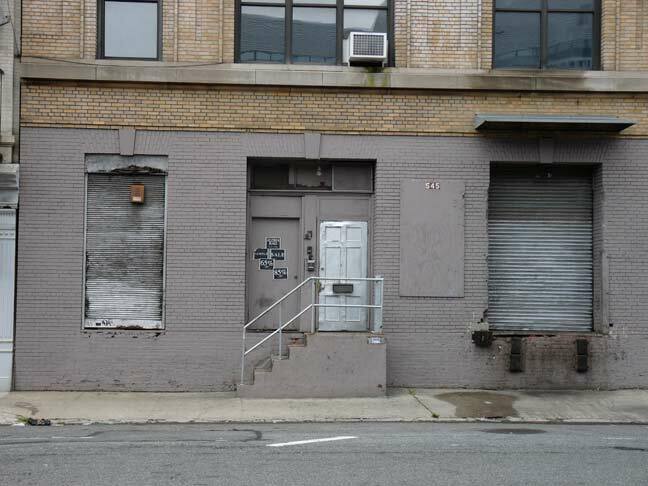 From 2000 to 2008 I worked in a building whose rear side was on Greenwich Street north of W. Houston. You are completely right about how quiet the street often was. Very few pedestrians even in the middle of the day, and much lighter traffic than on almost any other avenue. 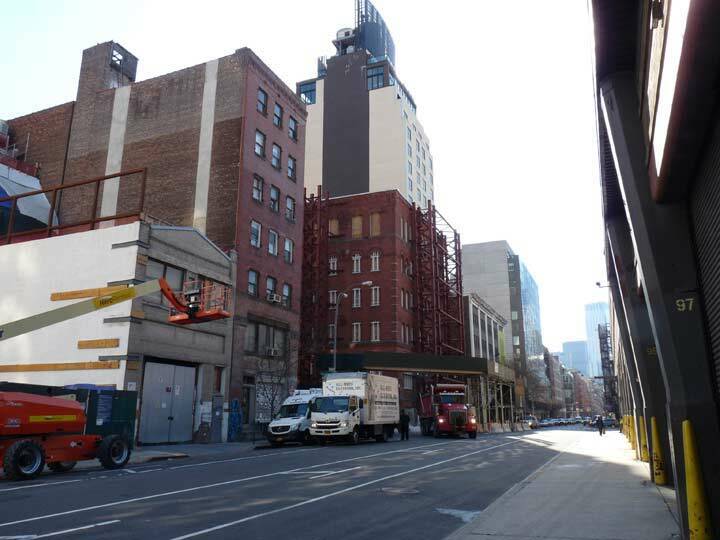 it seems the topper wasn’t enough for 9-19 ninth ave. this is a new facade that has been proposed. Doug Douglass says :, thanks! And thanks for sharing your great posts every week! 353-355-357 greenwich aka the ivy covered buildings were owned by famed photographer annie leibovitz. she bought them in 2003 for $3M and sold in 2014 for $30M. its like 11k sqft and has 13 fireplaces. quite a grouping! the buyers were clothing guy ralph lauren’s young son who is married to george bush’s niece. i think they have sold it since then too. 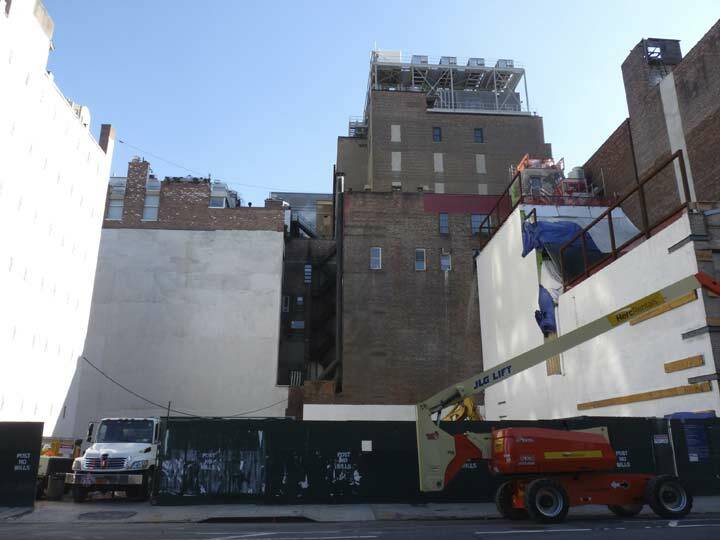 we in the neighborhood were very upset with leibovitz because most of that time she owned it it was shrouded in construction. it really looked a wreck for years. looks great again nowadays though and those vines on it are quite spectactular. The Archive building also housed at one time offices of the FCC. I took my 3rd class radiotelephone license exam in that building in the mid 1960’s! Your killing me with these photos of Greenwich st. I loved being a foot messenger in this area in the early 70s because it was a much quieter part of town.